Operations Management Systems: These systems comprise of Operations Support & Readiness Management Systems, Fulfillment Management Systems, Assurance and Billing Management Systems. These systems focus on addressing the requirements across functional domains like Customer Relationship Management, Service Management & Operations, Resource Management & Operations and Supplier/Partner Relationship Management. Strategy and commit systems: These focus on strategic planning, asset provisioning, financial provisioning & analysis, sales forecasting, resource planning & deployment, business unit evaluation, performance evaluation, competitive analysis, operational controls, market analysis, regulatory compliance management. 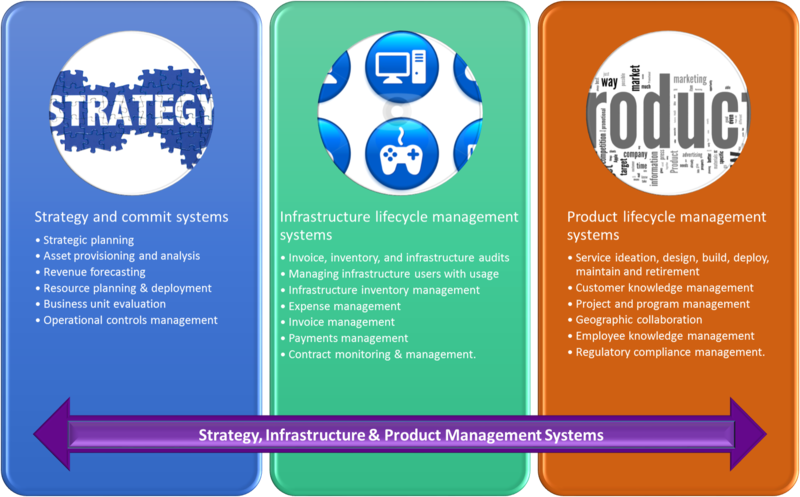 Infrastructure lifecycle management systems: These systems focus on conducting invoice, inventory, and infrastructure audits , managing infrastructure users with usage, infrastructure inventory management, expense management, invoice management, payments management, contract monitoring & management. 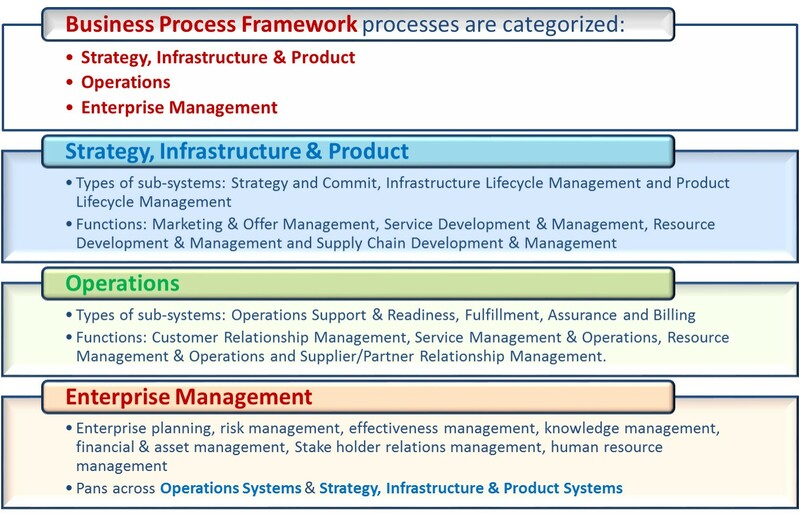 Product lifecycle management systems: These systems focus on Service ideation, design, build, deploy, maintain and retirement; gathering of customer needs and preferences and mapping those to current and future product capabilities; project and program management, geographic collaboration and knowledge management, regulatory compliance management. Operations Support & Readiness systems: These systems focus on managing services inventory, service configuration & activation, problem management, quality management and support services. Telecom billing & revenue management systems: These systems focus on yield optimization, service bundling and provisioning, customer usage billing, billing monitoring. However, it is important to note that Telecom Systems of any organization need to be inherently interact with the telecom systems of other organizations. This would facilitate seamless service to the end customer. 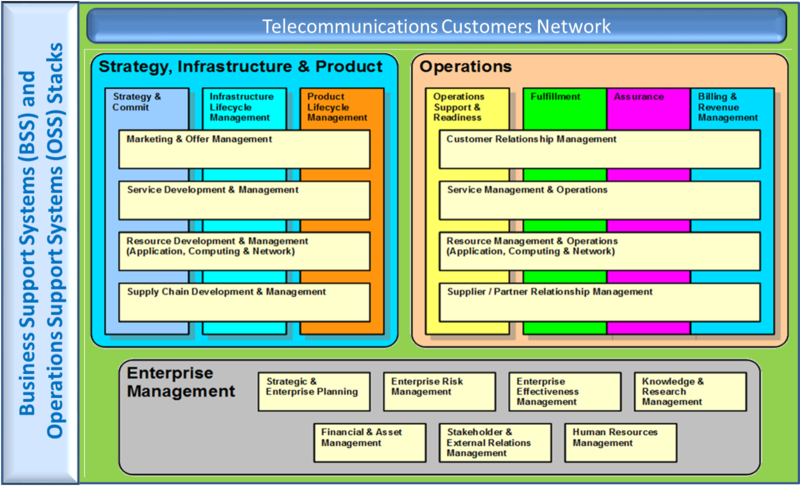 To meet this requirement, a set of framework, namely the telecommunications management network (TMN) was devised. The TMN provides a framework for achieving interconnectivity and communication across heterogeneous operating systems and telecommunications networks. 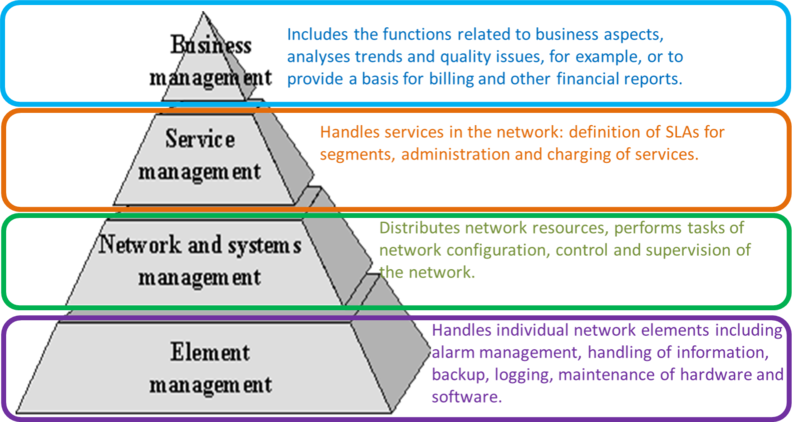 Business management layer: A management layer responsible for the total enterprise and not subject to standardization. Data communication network: A communication network within a TMN or between TMNs which supports the data communication function (DCF). Element management layer: A management layer which is responsible for management of network elements on an individual or collective basis. Managed resource: The abstraction of those aspects of a telecommunication resource (logical or physical) required for telecommunications management. Management layer: An architectural concept that reflects particular aspects of management and implies a clustering of management information supporting that aspect. Service management layer: Concerned with, and responsible for, the contractual aspects, including service order handling, complaint handling and invoicing of services to customers. Network elements: Represents telecommunication equipment (or groups/parts of telecommunication equipment) and supports equipment or groups of items considered belonging to the environment that performs network element functions. Network management layer: A management layer responsible for the management, including coordination of activity, of a network view. 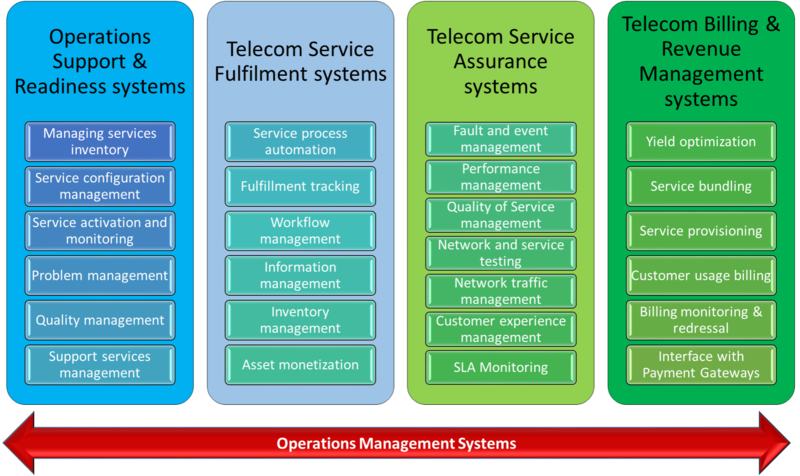 Operations systems function: A function block that processes information related to the telecommunications management for the purpose of monitoring/coordinating and/or controlling telecommunication functions including management functions. Public Telecommunication Operator (PTO): Is used to include telecom administrations, recognized operating agencies, private (customer and third party) administrations and/or other organizations that operate or use a Telecommunications Management Network (TMN). Transformation function: A function block which translates between a TMN reference point and a non-TMN (either proprietary or otherwise standardized) reference point. The non-TMN part of this function block is outside the TMN boundary. Stack Support: TMN defines a message communication function (MCF). All building blocks within the TMN network with physical interfaces would need to have an MCF. An MCF provides the protocols which are mandatory and also necessary to connect a block to a DCN. Performance management: includes activities which ensure that goals are consistently being met in an effective and efficient manner. 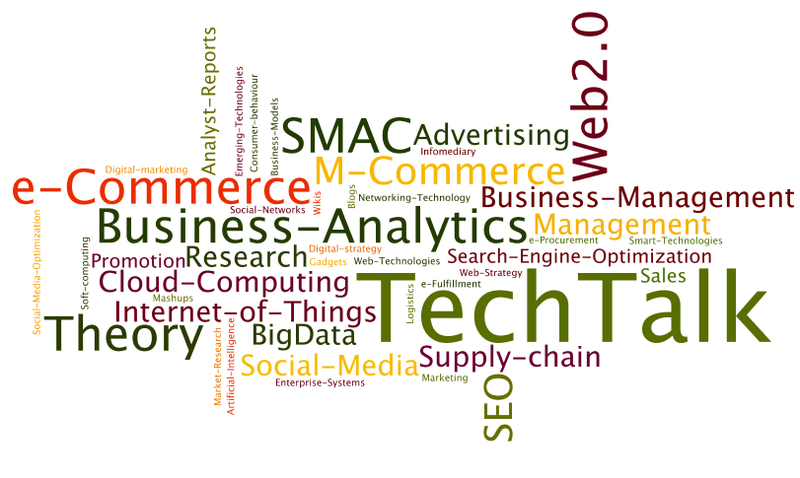 It can focus on the performance of an organization, a department, and even the processes to deliver the services. Fault management: Detect, isolate, and correct malfunctions in a telecommunications network, compensate for environmental changes, and include maintaining and examining error logs, accepting and acting on error detection notifications, tracing and identifying faults. 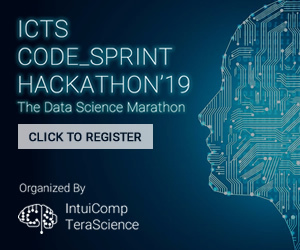 Configuration management: establishing and maintaining consistency of a services’s performance, functional and physical attributes with its requirements, design and operational information throughout its life. Accounting management: Analysis, planning, implementation, and control of financial data for reporting and managerial decision making while delivering services. Security management: identification of an organization’s assets (including information assets), followed by the development, documentation, and implementation of policies and procedures for protecting these assets.